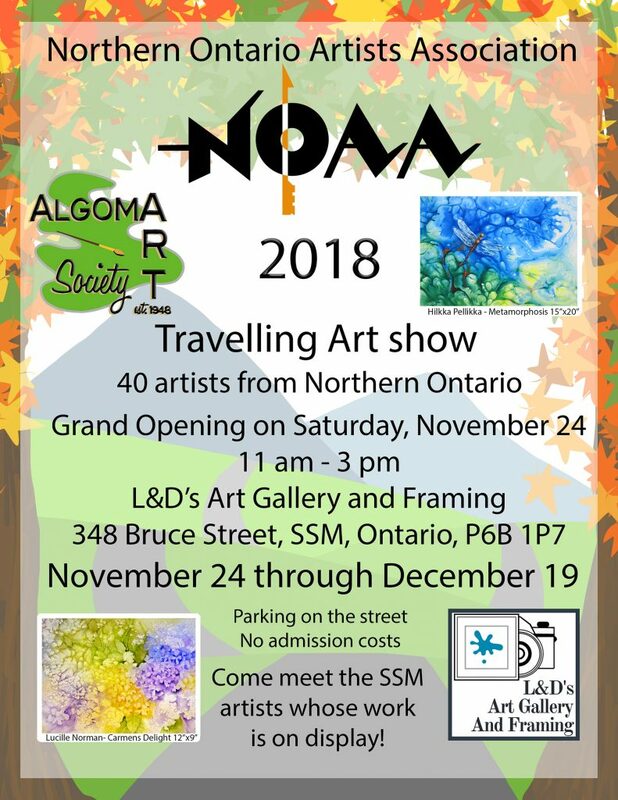 The Northern Ontario Artists Association (NOAA) is gracing the walls of local L & D’s Art Gallery and Framing for its fourth stop in a travelling art show that will be hitting locations across Northern Ontario. The exhibition starts this Saturday, November 24 from 11 – 3 and runs until December 19. Forty artists are participating in this showcase of the best work of the NOAA this year. Phyllis Dorman, Kathy Godfrey, Lucille Norman, Hilkka Pellikka and Lotte Steube are locals that have work chosen as part of the exhibition. They are part of the NOAA member group, The Algoma Art Society (AAS). Pellikka, Steube and Dorman have received numerous accolades from the NOAA as well as being long-standing members through the AAS. Dorman’s watercolour “Under the Deck,” Godfrey’s watercolour “Snowy Mountain Pass,” Norman’s watercolour “Carmen’s Delight,” Pellikka’s acrylic “Metamorphosis,” and Steube’s watercolour called “Symphony,” will be on display along with so many other great works from Northern Ontario. Member groups exhibiting with this NOAA travelling show are from Burk’s Falls, Cochrane, Lively, Sudbury, Elliot Lake, Kirkland Lake, Manitoulin, Moonbeam, Englehart, North Bay, Temiskaming, Walden and Haileybury. Donations of non-perishable food items are invited, to be donated to the food bank.